This hand colored map is entitled 'A General Map of the Discoveries of Admiral De Fonte & Others by M. De L'Isle' and was published in Gentleman's Magazine, 1754. This map depicts the mythical Northwest Sea Passage from Atlantic to Pacific proposed by many early navigators. North of California are depicted such fascinating features as the 'Sea of the West, Discovered by J. De. Fuca in 1592' and De Fontes Lake just west of Hudson Bay. There are routes labeled for important early explorers who failed to get a real grasp of the region, including, Captian Tchirikow, Routes of Rufses to Kamchatka, passage of St. Anthondy of Padua, etc… There are also many bodies of land described as, 'Land seen by Rufses in 1742' or 'Land seen by M. Spangburg in 1728.' This map also depicts very important early assumptions regarding the Northern Polar Region. This is a truly important map depicting the hopes and dreams of early American cartography. Bartholomew de Fonte (fl. c. 1639 - 1641). The origins of the De Fonte legend can be traced to a 1706 English publication entitled "Memoirs of the Curious". This short-lived magazine published a previously unpublished account by a Spanish Admiral named Bartholomew de Fonte. 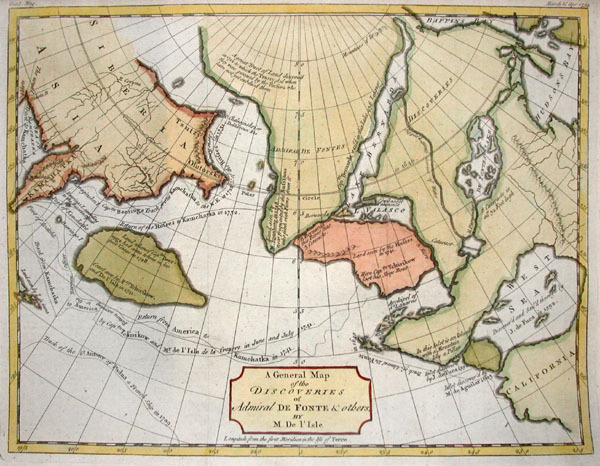 De Fonte is said to have sailed up the Pacific coast of North America in 1640. On this voyage he apparently discovered a series of gigantic lakes, seas, and rivers heading eastward from the Pacific towards Hudson Bay. The De Fonte story relates how, on one of these great inland lakes, he met with a westward bound ship from Boston that must to have come through the Northwest Passage. Today, based upon inaccuracies and falsities, we know the entire De Fonte article to have been a fabrication, however, it set 18th century afire with speculation that a Northwest Passage must indeed exist. The De Fonte letter influenced cartography of the Pacific Northwest, particularly the French school of De L'Isle (Delisle), for nearly 100 years. Map is in FINE condition.